Found your blog completely by chance and very glad I did. What amazing shots! As an art director on hiatus, I can tell you it\'s a real pleasure to see the amazing quality of your shots. I\'ve borrowed one for my site, but of course linked to your site. Hope that\'s okay. Best, S.
p.s. 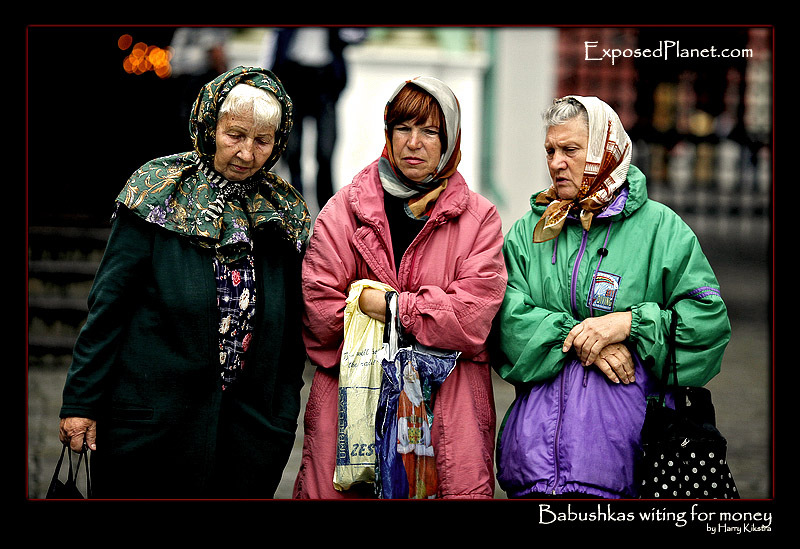 forgot to mention I\'m especially fond of babushkas, probably something to do with my Russian roots. But also this shot captures their expressions so well. And the colours of their clothing and background are wonderful! The story behind "Babushkas waiting for coins"
While the Babuskas at the Mineralnye Vody airport -in the Caucasus- were aggressive and tried to take our candy bars out of our hands, these city-colleagues were a bit nice. Here, just 2 meters before the main gate to enter the Red Square, a large compass is made on the brick floor. You are supposed to stand in the centre, throw some coins in the air and likely you will return, be happy, get rich or all of the above.